In a case even a rightwinger would support, Milnes Foods strikers are continuing their work stoppages .While progress has been made in areas, the right to collective bargaining, union representation, pro-rata pay for the cleaners and mechanics are some of the outstanding issues in this bitter dispute between some seventeen or so brave SIPTU strikers and the company of Milne Foods, of Birr in Co. Offaly. A Labour Court hearing is lated for December 12th. They are on one day work stoppages each Friday from now to Christmas, support from all would be appreciated. The dispute arose a long time ago - workers were asked to sign away overtime rates and other conditions as the company was in trouble. A long standing issue of alleged bullying by members of middle management, and the refusal of workers rights to their chosen representative when in discussion or disputes led to the formation of the SIPTU branch in the factory, led by current shop steward John Carty. All avenues of negotiation were followed through by organiser Mick Browne, and the company refused to recognise or negotiate with the union, or indeed engage with either the Labour Realtions Commision or the Labour Court. In hearings at both of these, the workers won their case, both on merit and by default, as the firm did not show up. A ballot for strike action was held, and passed, and a series of work stoppages has being ongoing for the past six or so months, along with a march through the town of Birr, attended by Ellen King, and some local councillors. Notable in their presence were the Socialist Workers Party and Sinn Fein, and by their absence the Labour Party and the local Socialist Party. A meeting with Chairman of Birr Town Council, Cllr John Carroll, and other councillors was organised, as was meetings with local TD's, with questions being asked in Dail Eireann on the workers behalf by Sinn Fein TD's, with further assistance from the Workers and Unemployed Action Group of Seamus Healy. 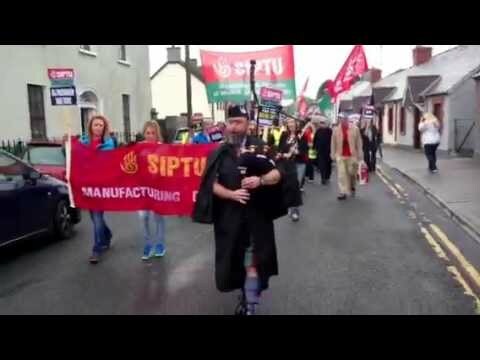 What is notable about this strike, and what is great about it, is that it is powered by non nationals, the only Irishman on the line being John Carty, the SIPTU shop steward, giving lie to the claims by some that non nationals reduce wages and conditions, here they are the only ones fighting for same. John Carty, the shop steward for the SIPTU workers at Milne Foods, addressed the recent conference for the Manufacturing Division. SIPTU have a solidarity fund, those wishing to support can send donations to SIPTU Manafacturing Division at Liberty Hall in Dublin.